More than 2,500 years ago, Buddha Shakyamuni opened the door to enlightenment. What he revealed in that moment – the sublime state of boundless happiness, freedom and the compassionate ability be of limitless benefit to others – is still available to all of us, right now. An empowerment is a blissful and inspiring guided meditation through which we connect directly to Buddha’s enlightenment and awaken our own potential – or Buddha nature – so as to actualize it ourselves. 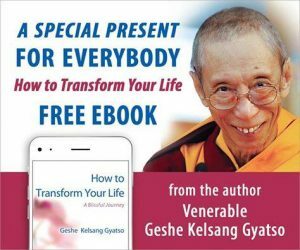 Gen Kelsang Gomlam will also give a commentary to the Liberating Prayer: an inspiring chanted meditation with many levels of meaning and great power to transform our mind. . If you have never been to an empowerment before, don’t worry, Gen Gomlam will provide background in the introduction Friday Night, and you will be guided in what to do during the actual ceremony on Saturday. Everyone is welcome to be a part of this wonderful event. This price is for all attending, including GP/FP Members. There is a 25% Discount for Benefactors (Please pay at Center). Children ages 9-15 are at a 50% rate of the adult price. Kids 8 and under are free!